Carrot cake is my family’s all time favourite cake, and being competely unbias the carrot cake at No33 Cafe is the BEST you will ever buy. I’ve used this as the basis for mine, but made a couple of slight changes to suit it to my exact tastes. 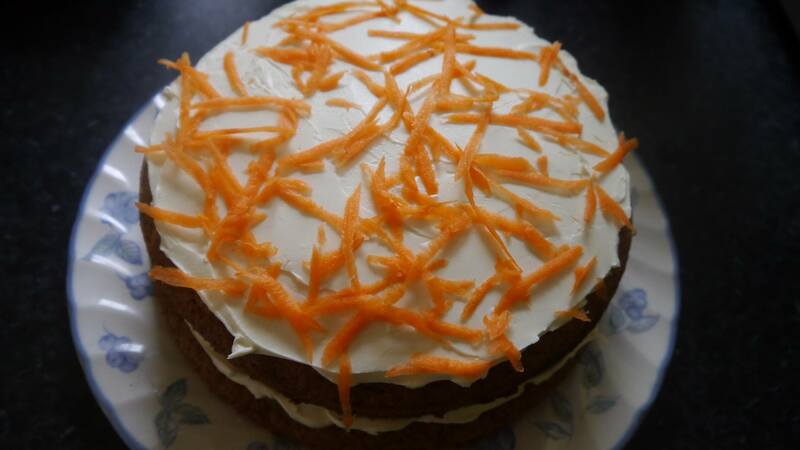 It’s also incredibly easy to make, and has got carrots in so pretty much counts as one of your 5-a-day. Whisk the eggs and both sugars together in a large bowl until well combined, then add in the oil, vanilla, sift in the dry ingredients, and beat everything together. Split the batter between two 8 inch cake pans lined with grease proof paper and oil. Bake for 25 minutes, or until when inserted with a cake skewer it comes out with just a few crumbs, and leave to cool on a rack. For the icing, gently beat the mascarpone or vegan cream cheese until smooth, then add the vanilla, sifted icing sugar and fold in gently. If the icing is too runny, place it in the fridge for an hour until it hardens. When the cake is cool and the icing is ready, spread half of the icing onto one cake with a knife (palette knifes are particularly great at this), then repeat with the next layer of cake. Grate some extra carrrot on top to decorate, and serve. This keeps well in the fridge for up to 5 days.